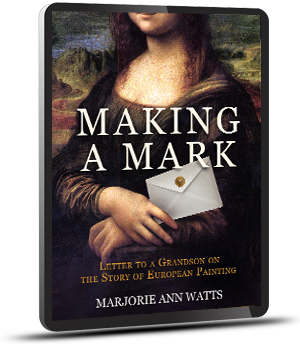 MAKING A MARK was written in order to answer the author’s teenage grandson’s questions about art (What is Cubism? Who is Cézanne?). It starts with the first known cave paintings, and progresses through the great artistic periods and movements in the western world until the 21st century. Written in a highly accessible style by a painter and illustrator, the book is an excellent basic introduction to the history of European painting for someone of any age, curious about the subject and wanting to understand how and why it has developed as it has over the centuries.